30hands is one of my all-time favorite free iOS apps for Digital Storytelling. This is a simple app to use w/ a detailed walk-through that helps any first time user create their own. Everything is done in a user friendly drag-n-drop interface that allows students to add/take photos, draw, and record narration to each slide. Once the story is complete it can then be uploaded to the cloud via the free educational community 30hands Learning. This is a great LMS that lets educators share their student work, assess them, and much much more. 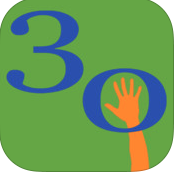 I highly recommend checking out the 30hands app & Learning community by clicking here!! !